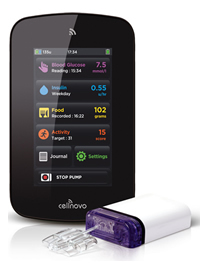 The Cellnovo insulin pump is the first insulin pump to be released in the UK with touch-screen controls. It is a versatile pump, thanks to its small size, able to be worn as patch or to be used as a tethered pump with tubing. Cellnovo are a British company and their innovative pump has benefited from development by a Chief Science Officer who has previously worked for NASA in Houston. The Cellnovo insulin pump system is small and light weight and can be worn either as a patch pump or as a tethered pump. When worn as a patch pump, you can do away with tubing. In this case, both the cannula and the pump are held onto the skin with adhesive. In some cases, you may wish to use tubing, such as to choose an infusion site away from you wish to wear the pump. When worn as a tethered pump, you can use either long tubing or very short tubing. The pump can also be disconnected and reconnected at any time, whether worn as a patch or tethered pump. The Cellnovo is the first insulin pump to be released in the UK that takes advantage of touch-screen technology. This allows the handset to not only look great but to be very intuitive to use as well. Another advantage of the touch-screen is that you can easily type notes into the pump as well as adding new foods to the food database. One of the key advantages of the Cellnovo system is that a wide range of data can be logged, viewed and analysed together. In terms of logging physical activity, the Cellnovo pump features a tiny sensor which is able to track and record movement and send this data wirelessly to the remote handset. To analyse the data in more detail, the data can be sent wirelessly to your computer, laptop or tablet, allowing you to view graphs and charts in detail with Cellnovo’s secure mobile diabetes management portal. In addition, your health team can also be given access to see your results and help with diabetes management decisions with all the data they need to hand. The Cellnovo pump is also kind to the environment as batteries can be simply recharged. To make this all the more simple, you are provided with two different pumps so that one pump can be worn whilst the other is recharged.